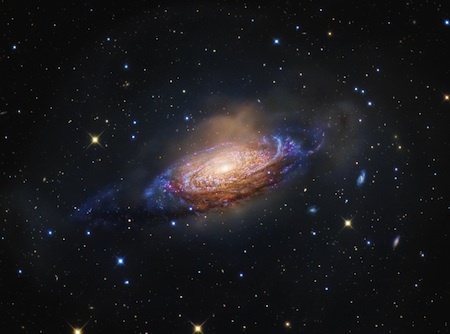 Marvel at this great picture of NGC 3521, a spiral galaxy 35 million light years from Earth. Spanning some 50,000 light-years the galaxy sports characteristic patchy, irregular spiral arms laced with dust, pink star forming regions, and clusters of young, blue stars. Remarkably, this deep image also finds NGC 3521 embedded in gigantic bubble-like shells. The shells are likely tidal debris, streams of stars torn from satellite galaxies that have undergone mergers with NGC 3521 in the distant past. "Fessenden's eyes had been following my stupefied change of expression. He said calmly, "Yes, Bradley, it is true. That is a tiny, self-sustaining universe, with its own suns, nebulae and worlds. Everything in it, down to the atoms which compose it, is infinitely smaller in scale than our own. But it is a real universe, like our own." Again Lora increased the magnification. The central planet grew, showing a pale green ocean lapping faintly at a low shoreline. Thanks to Fred Kiesche of The Eternal Golden Braid for tweeting this item.